Arthritis can affect many joints of the body including the shoulder. The shoulder joint is made up of three bones: the scapula (shoulder blade), humerus (arm bone) and clavicle( collar bone). There are two joints in the shoulder. 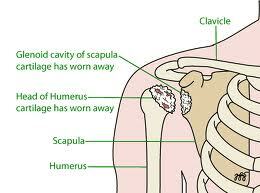 One is where the clavicle meets the tip of the scapula, called the acromion. The other is where the head of the humerus meets the scapula. There are multiple types of arthritis including rheumatoid and osteoarthritis. Osteoarthritis is the most common type of arthritis of the shoulder. Osteoarthritis occurs when the cartilage, which covers the bones, is worn away. During movement, the bones rub against each other, causing pain. The pain is located around the shoulder. It is worse with motion and relieved by rest and medication. The pain is dull and aching in nature. It may cause difficulty with sleeping. The patient may experience a popping or grating sensation in the shoulder upon motion. Motion of the shoulder is gradually and progressively limited. X-rays of the shoulder are useful to determine the extent of the problem and to look for other causes of pain. MRI scans of the shoulder may also be helpful. There are other causes of arthritis of the shoulder including post-traumatic, rotator cuff tear, avascular necrosis, collagen vascular disease and others. Initial treatment is conservative and includes medication, such as non-steroidal anti-inflammatory medications, physical therapy, heat and ice. Injection into the shoulder with a dilute solution of a local anesthetic and a steroid can decrease the pain as well. In severe cases, surgery may be needed. This may include a shoulder arthroscopy, where a doctor looks inside your shoulder to see and fix problems.